Renowned Dutch vocalist Anneke Van Giersbergen paid tribute to Chris Cornell by performing a cover version of AUDIOSLAVE‘s “Like A Stone” during her acoustic set on June 30 at the 20th-anniversary edition of the Tuska festival in Helsinki, Finland. You can watch video footage of the performance below. Anneke‘s new band, VUUR, will release its debut album, “In This Moment We Are Free – Cities”, on October 20 via InsideOut Music. VUUR was created as a vehicle for the heavy progressive metal side of Anneke‘s career. The name VUUR — translated from Dutch as “fire”, which can also be interpreted to mean “passion” or “drive” — was chosen as a moniker to represent Anneke‘s metal side, with the idea that when fans buy a ticket with the VUUR name on it they will be getting her heavy progressive music, while an Anneke Van Giersbergen show will be entirely different. Cornell was pronounced dead on May 18 after being found unresponsive in his Detroit hotel room the previous night. SOUNDGARDEN had played a show earlier that evening. The 52-year-old had sedatives and an anxiety drug in his system on the night he died by hanging himself. According to a completed toxicology report released by Michigan’s Wayne County Medical Examiner, the drugs didn’t contribute to the cause of death. In addition to SOUNDGARDEN, Cornell sang with AUDIOSLAVE and TEMPLE OF THE DOG, while also recording four solo studio albums and one live set on his own. 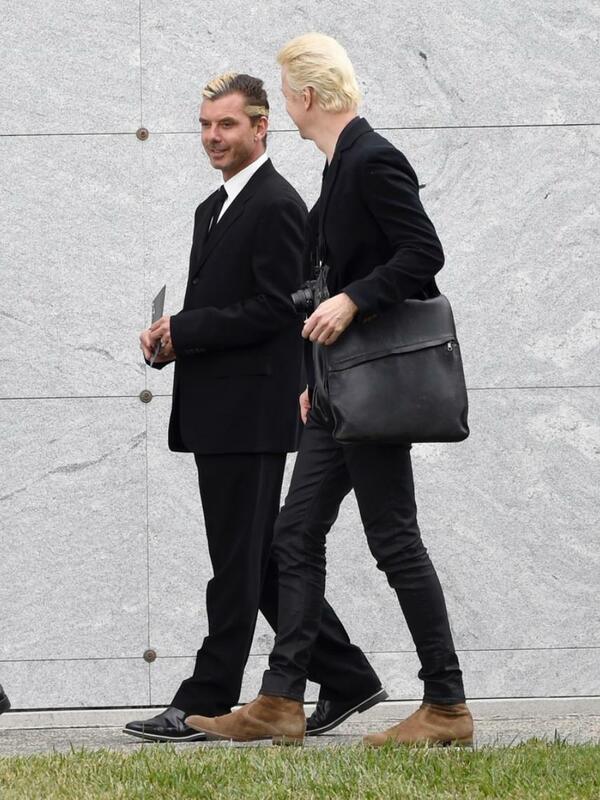 Chris was laid to rest on May 26 at the Hollywood Forever Cemetery in Los Angeles. Norah Jones covered “Black Hole Sun” at the Fox Theatre in Detroit last night. It was the first concert at the venue since Chris Cornell’s final performance with Soundgarden last Wednesday. Surviving Audioslave members Tom Morello, Brad Wilk, and Tim Commerford performed “Like a Stone” in honor of Chris Cornell a few days ago in the studio with no vocals. Watch below. SYSTEM OF A DOWN vocalist Serj Tankian joined surviving members of AUDIOSLAVE during a PROPHETS OF RAGE show last night at the Rock Im Park Festival festival to pay respect to late Chris Cornell with a “Like a Stone” performance. Fan-filmed video footage can be seen below. Cornell was known for his role as one of the architects of the 1990s grunge movement, for his extensive catalog as a songwriter and for his near four octave vocal range as well as his powerful vocal belting technique. He released four solo studio albums, Euphoria Morning (1999), Carry On (2007), Scream (2009), Higher Truth(2015) and the live album Songbook (2011). Cornell received a Golden Globe Award nomination for his song “The Keeper” which appeared in the film Machine Gun Preacher and co-wrote and performed the theme song to the James Bond film Casino Royale (2006), “You Know My Name“. Another portion of tributes to Chris Cornell, I will post the last episode of his covers next week. A visibly shaken Mustaine had to start by somewhat patiently explaining to some of his younger fans who Cornell was, and get some of the rowdier fans to stop yelling out requests so he can properly pay tribute. The Pretty Reckless opened for Soundgarden during the band’s final shows this past week prior to frontman Chris Cornell’s death, and frontwoman Taylor Momsen sang Audioslave’s “Like a Stone” in honor of Cornell yesterday for a tear filled incredible performance. Momsen discussed her excitement about opening for Soundgarden in an interview a couple of weeks ago with Alternative Nation reporter Lauryn Schaffner. “Well we’ve only played with them once before and it was in Quebec City. They were amazing and I love Matt Chamberlain who was playing with them at the time, but I’m very excited to see them with Matt Cameron tonight. It’ll be my personal first time seeing Matt Cameron play, and he’s one of my favorite drummers. Toronto’s Choir! Choir! Choir! have paid tribute to late singer Chris Cornell with a stirring rendition of Soundgarden’s Black Hole Sun. The choir have previously covered a range of songs, including Nirvana’s Smells Like Teen Spirit, Bon Jovi’s Livin’ On A Prayer, Joy Division’s Love Will Tear Us Apart and Metallica’s Nothing Else Matters. Soundgarden was due to headline the Rock on the Range Music Festival on Friday night [May 19th]. In the wake of Chris Cornell’s tragic passing, the festival staged an all-star tribute featuring Corey Taylor of Slipknot, Bush, and Live. Video highlighting Cornell’s isolated vocals was also shown. Taylor covered Temple of the Dog’s “Hunger Strike”, Bush played Soundgarden’s “Black Hole Sun”, and Live performed Audioslave’s “I Am the Highway’. Watch fan-shot footage from the tribute below. ​​Following the stunning and heartbreaking death of Chris Cornell, tributes to the late singer have been showing up everywhere. Last night in Indianapolis, Red Hot Chili Peppers delivered their own salute to the beloved musician. During the band’s set at Bankers Life Fieldhouse on Thursday evening, guitarist Josh Klinghoffer opened the encore by coming out on stage alone. He performed a cover of “Seasons”, a solo acoustic song Cornell had written for the Singles soundtrack. Watch video of the performance below (via Rolling Stone). Chris Cornell, the lead singer for Soundgarden, will be laid to rest on May 26 in Los Angeles, two people with knowledge of the plans told CNN Saturday. Cornell’s body will be flown from Michigan to Los Angeles on Sunday, and Cornell will be buried at the Hollywood Forever Cemetery, the sources said. Late Stone Temple Pilots frontman Scott Weiland’s funeral was held at the Hollywood Forever Cemetery in December 2015, with members of Stone Temple Pilots, Velvet Revolver, and Jane’s Addiction in attendance. Pearl Jam frontman Eddie Vedder has left for his European solo tour, and Chris Cornell’s mother in law is claiming he will not be attending Cornell’s Celebration of Life on Friday at the Hollywood Forever Cemetery. Vedder kicks off his tour on Saturday in Amsterdam, and the tour runs through the end of June. Cornell’s mother in law Toni Karayiannis criticized Vedder on Twitter for not attending the ceremony, and for a variety of other reasons. At first she did not say who she was talking about by name, but she later retweeted messages critical of Vedder, and tweeted about him singing “Daughter.” Pearl Jam released a tribute photo entitled ‘Chris’ on their website a few days ago. We usually post written text from tweets in addition to embedding them, but due to the highly emotional nature of these remarks, we are only embedding them in case Karayiannis decides to remove any of them at a later date. Everyone grieves in their own way, especially with a terrible tragedy like this. We have yet to hear from Vedder about how he is dealing with the loss of his friend of 27 years, so it is impossible for us to judge him or anyone involved in this situation. Our thoughts and prayers are with the Cornell family, Eddie Vedder, and all of Cornell’s other friends and fans. The world is mourning an angel ! Chris Cornell! Except one person the person he helped the most! Not human not a man! What did his 3 kids done to you?? Except oh yes I forgot! Their father gave u a chance to be who u are ! And that coming from your mouth! View Vedder’s tour dates below. The first video and photos have surfaced from Chris Cornell’s Celebration of Life at the Hollywood Forever Cemetery. More video footage has surfaced from Chris Cornell’s funeral at the Hollywood Forever Cemetery from Friday. The new video initially shows Josh Brolin, Alice In Chains’ Jerry Cantrell, Bush frontman Gavin Rossdale, Filter frontman Richard Patrick, and then 1:05 in Dave Grohl and Courtney Love are shown hugging Chris Cornell’s surviving bandmates, Soundgarden’s Matt Cameron and Audioslave’s Tom Morello. Watch a video of the beautiful and surreal moment below. The first video clips of one of the eulogies at Chris Cornell’s funeral has surfaced, and it is two portions of former Audioslave guitarist Tom Morello’s eulogy. The clips are short, but a videographer also included another quote that Morello said during the service. Watch two video clips of Morello’s eulogy below. 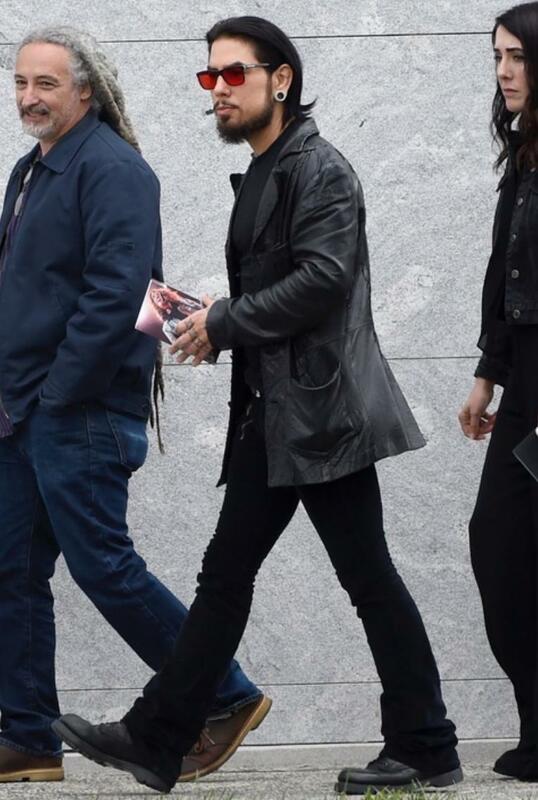 Family, friends, collaborators, and contemporaries came out in force to honor Chris Cornell during a funeral service held at the Hollywood Forever Cemetery last Friday. Soundgarden’s three surviving members, Kim Thayil, Ben Shepherd, and Matt Cameron were in attendance, as was founding bassist Hiro Yamamoto. 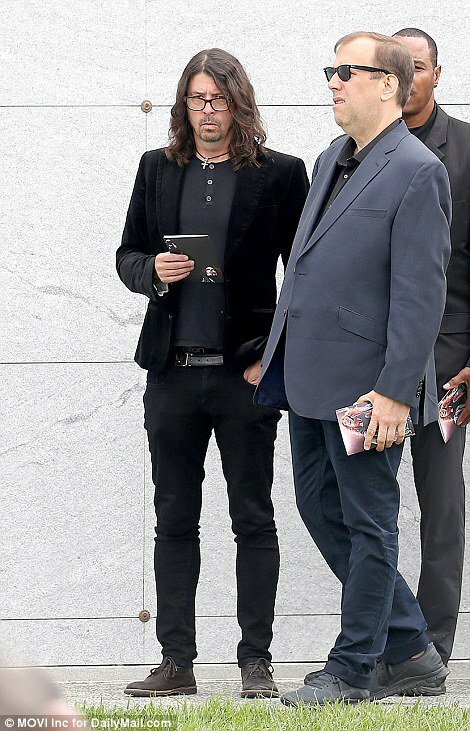 Following the ceremony, Thayil, Cameron, and Yamamoto went out to dinner together, joined by longtime Soundgarden producers Jack Endino and Stuart Hallerman, and Cornell’s ex-wife, Susan Silver. Hallerman shared a photo of the group with the caption, “We’re all living on ‘silver linings’ today, but they are abundant” (via Alternative Nation). In the photo are Soundgarden guitarist Kim Thayil, former Soundgarden producer Jack Endino, Soundgarden drummer Matt Cameron, former Soundgarden bassist Hiro Yamamoto, and Chris Cornell’s ex-wife Susan Silver. 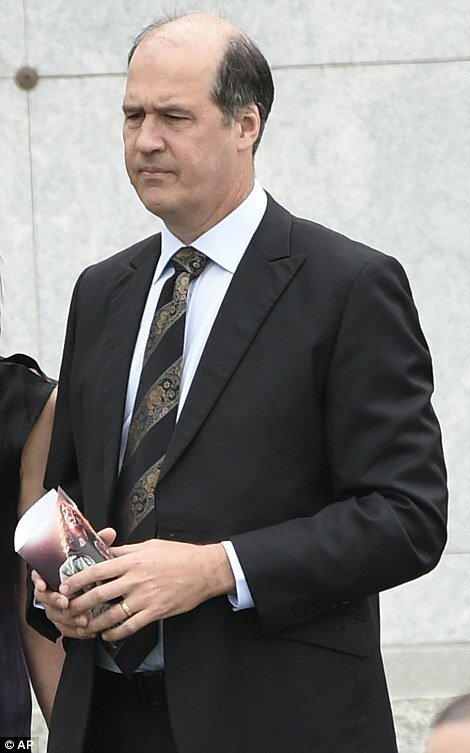 Ben Shepherd was not featured in the photo, and the only photograph that appeared to surface of him at the funeral was a picture of him next to Filter frontman Richard Patrick. I really hate writing here recently. We need to keep the memory alive so that the ones we love remain alive as well. Here are some news from the last week’s funeral of Chris Cornell, I suspect you must have already seen them in various rock magazines but I will gather them all here. Part 1 today and soon you will see Part 2. I will be also adding gradually all the tributes to Chris that various artists have performed, stay tuned. Chris Cornell was laid to rest during a private funeral service held at Los Angeles’ Hollywood Forever Cemetery on Friday afternoon. As part of the service, Linkin Park frontman Chester Bennington, a close friend and godfather to one of Cornell’s children, sang Leonard Cohen’s “Hallelujah”. Video of the touching tribute has now surfaced and you can hear a snippet here. 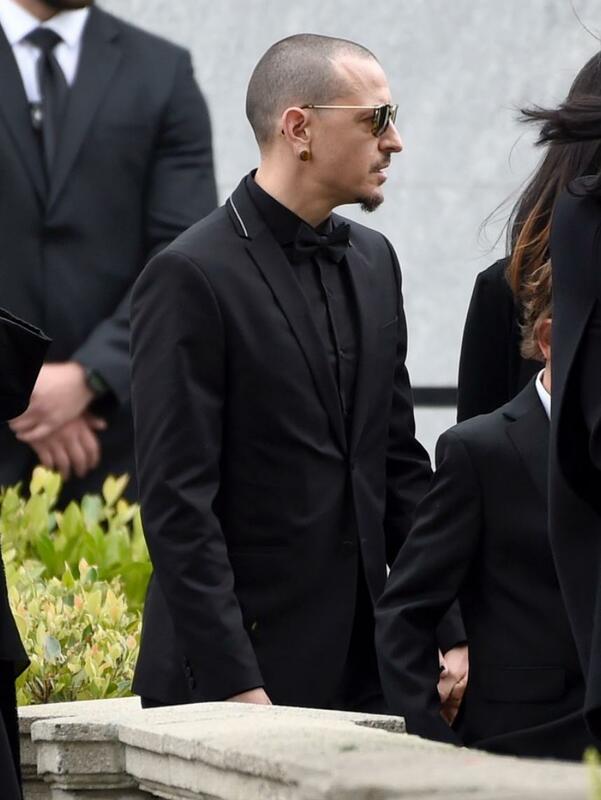 Bennington was just one of several notable musicians who participated in Cornell’s funeral service. The singer’s former bandmates Kim Thayil, Matt Cameron, and Tom Morello all made remarks. Many others were in attendance, including: Metallica’s James Hetfield and Lars Ulrich; Foo Fighters’ Dave Grohl, Taylor Hawkins, and Pat Smear; Nirvana’s Krist Novoselic; Courtney Love; Jane’s Addiction’s Perry Farrell and Dave Navarro; and Alice in Chains’ Jerry Cantrell. 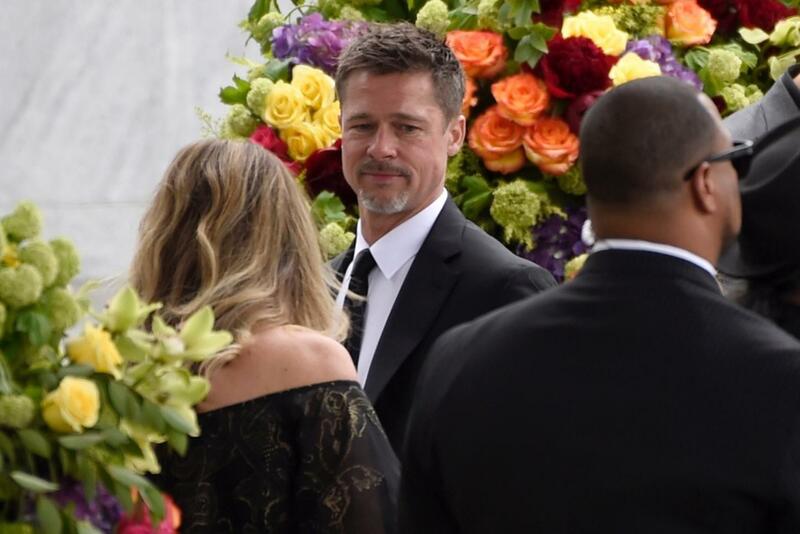 Brad Pitt and Pharrell joined mourners Friday at Soundgarden frontman Chris Cornell’s memorial service at a storied Hollywood cemetery, ABC is reporting. Soundgarden music played from a portable speaker outside the cemetery’s gates as a group of about a dozen fans gathered outside. 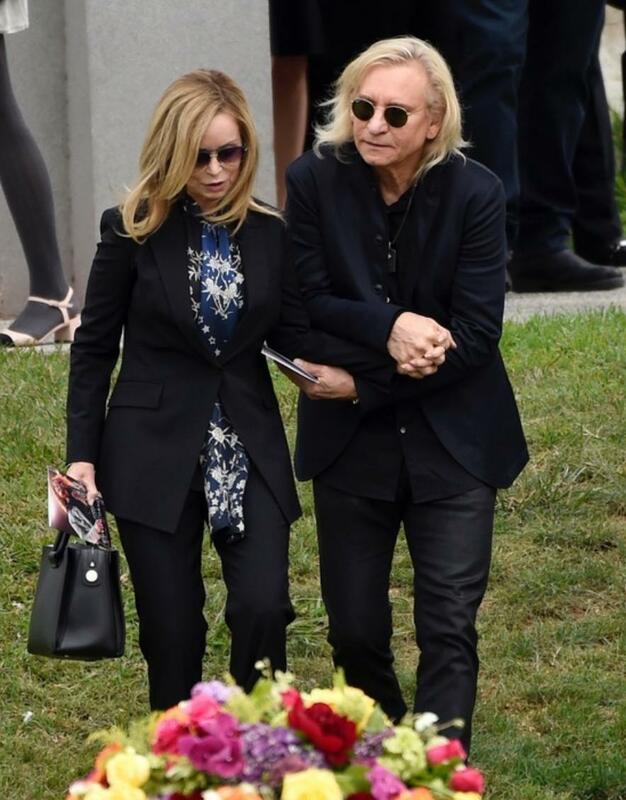 Chauffeured cars and sport utility vehicles arrived carrying mourners, including Cornell’s widow and his two youngest children, for a private service on the Fairbanks Lawn at Hollywood Forever Cemetery. Rows of white chairs and floral arrangements were set out under overcast sky. Audioslave’s “Like a Stone” played from speakers. 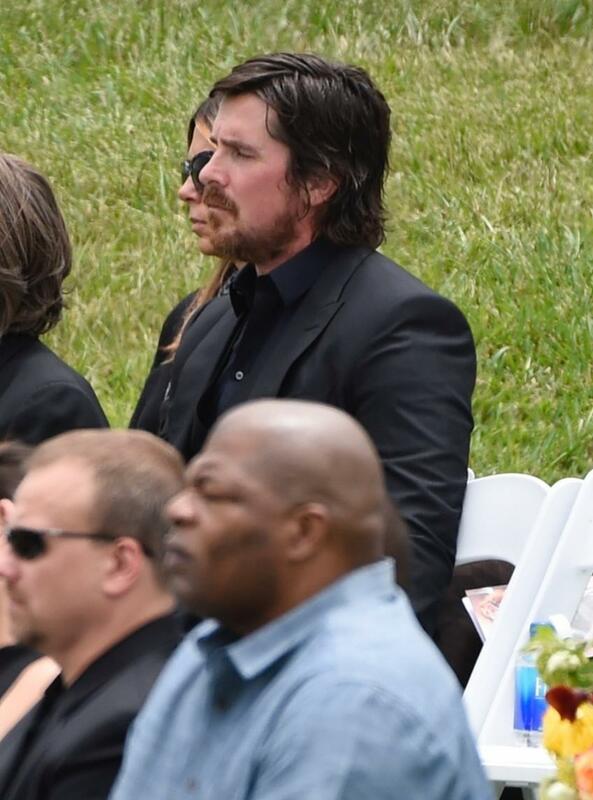 Brad Pitt, Pharrell, Dave Grohl, Pat Smear, Lisa Marie Presley, Dave Navarro, Jimmy Page, Courtney Love, Gavin Rossdale, James Franco, Christian Bale, Josh Brolin, Billy Idol, Krist Novoselic, Joe Walsh, Lars Ulrich, and James Hetfield attended Chris Cornell’s funeral. The singer was eulogized by Tom Morello, Pearl Jam’s Jeff Ament, and Matt Cameron, Linkin Park’s Chester Bennington and Brad Delson, Soundgarden’s Kim Thayil and Josh Brolin. Chris’ wife Vicky was also in attendance. The report states that the surviving members of Soundgarden and Audioslave were in attendance. View the photos below via TMZ/AP. Among those who came to pay tribute were Lars Ulrich and James Hetfield of Metallica, and Dave Navarro of Jane’s Addiction. 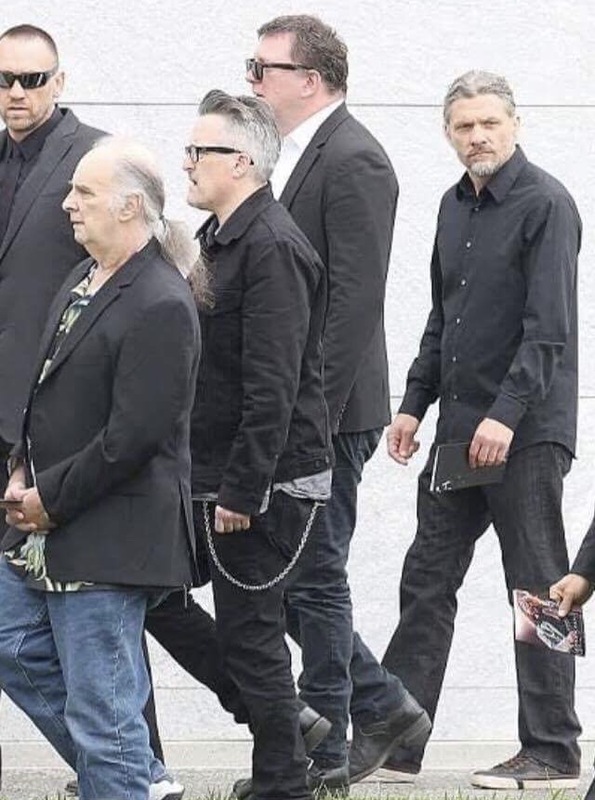 New video has surfaced of Alice In Chains singer/guitarist Jerry Cantrell with Pearl Jam bassist Jeff Ament and Pearl Jam/Soundgarden drummer Matt Cameron at Chris Cornell’s funeral. 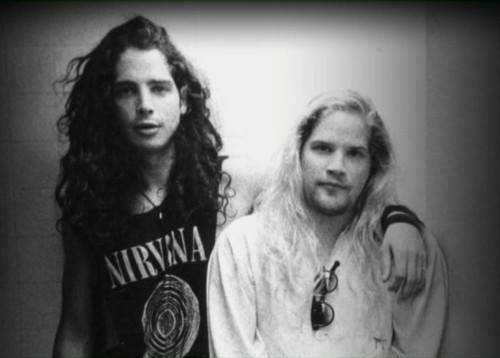 The three are hugging and putting their arms on each other mourning the loss of their fellow Grunge legend. The video also includes Alice In Chains members William DuVall and Sean Kinney, along with ex-Stone Temple Pilots/Linkin Park singer Chester Bennington consoling the Cornell family. Brad Pitt and Bush frontman Gavin Rossdale are also in the video. Click the arrow to enlarge it. 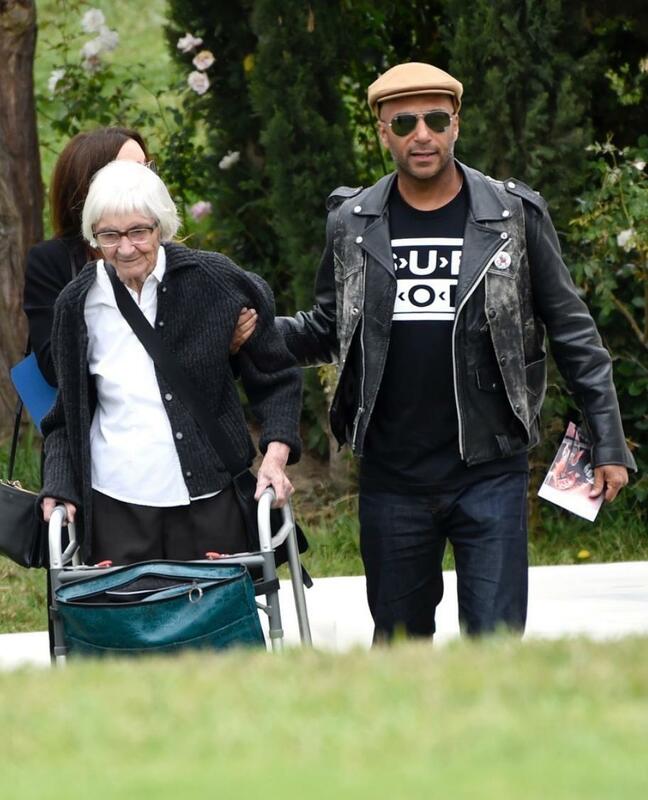 New photos have surfaced of surviving Soundgarden member Matt Cameron embracing surviving Audioslave member Tom Morello, along with Morello talking to Courtney Love at Chris Cornell’s funeral on Friday at the Hollywood Forever Cemetery. View the photos below, along with Alice In Chains’ Jerry Cantrell mourning Cornell. Someone Please Tell Me This Is NOT Happening! They say that Chris Cornell died but my heart just screams, ‘Nooooo!’. Please, tell me this is not happening! SOUNDGARDEN And AUDIOSLAVE frontman Chris Cornell has died at age 52, according to his representative. In a statement to The Associated Press, Brian Bumbery says Cornell died today in Detroit. Bumbery called the death “sudden and unexpected” and said his wife and family were shocked by it. The statement said the family would be working closely with the medical examiner to determine the cause and asked for privacy. Cornell‘s last social media posted came just 8 hours ago when he tweeted about SOUNDGARDEN‘s show in Detroit. Read the news 😀 ! 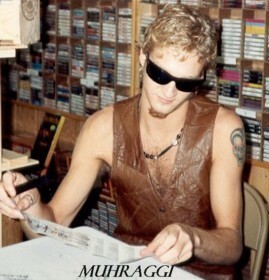 According to The Pulse Of Radio, eight previously unreleased songs from late ALICE IN CHAINS lead singer Layne Staley are currently being restored and properly mixed by Seattle-based audio designer Jesse Holt. The tunes all have vocal tracks from Staley on them and Holt has asked Staley’s MAD SEASON bandmate, PEARL JAM guitarist Mike McCready, for help in completing them. 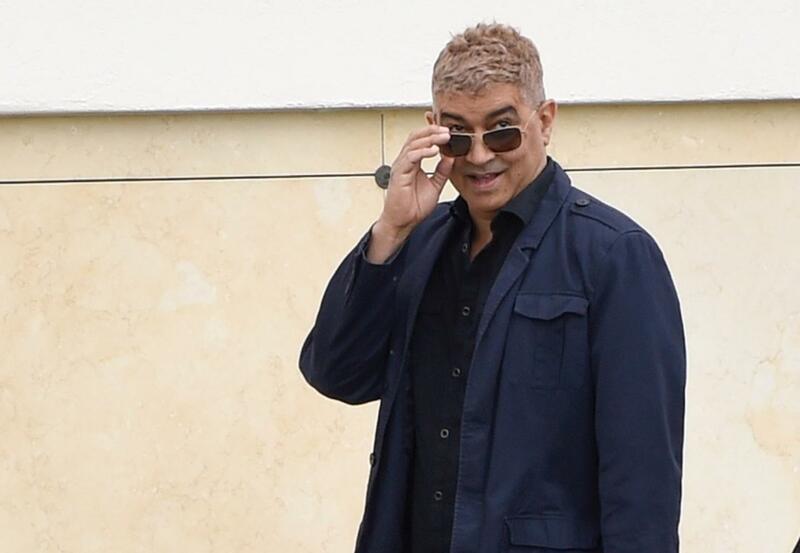 Reportedly among the songs is “Things You Do”, which has surfaced online in various forms in the years since Staley died of a drug overdose in April 2002. Before his death, Staley had planned to work on a solo album and also intended to record vocals for a song by metal outfit TAPROOT. The demo of the song was in Staley’s CD player when he was found dead. There are also rumors that Staley was going to audition for the band that eventually became AUDIOSLAVE. He had reportedly gotten a call from the instrumental members of RAGE AGAINST THE MACHINE about singing with them, but never made it. SOUNDGARDEN’s Chris Cornell took the job instead, recording three studio albums with that act. The source for the eight songs was not made immediately clear by Holt, and it is also not clear if there is any chance of them being released. ALICE IN CHAINS was inactive for several years before and after Staley’s death, but regrouped in 2006 with William DuVall on guitars and vocals. The band has since cut two studio albums and is working on a new one.